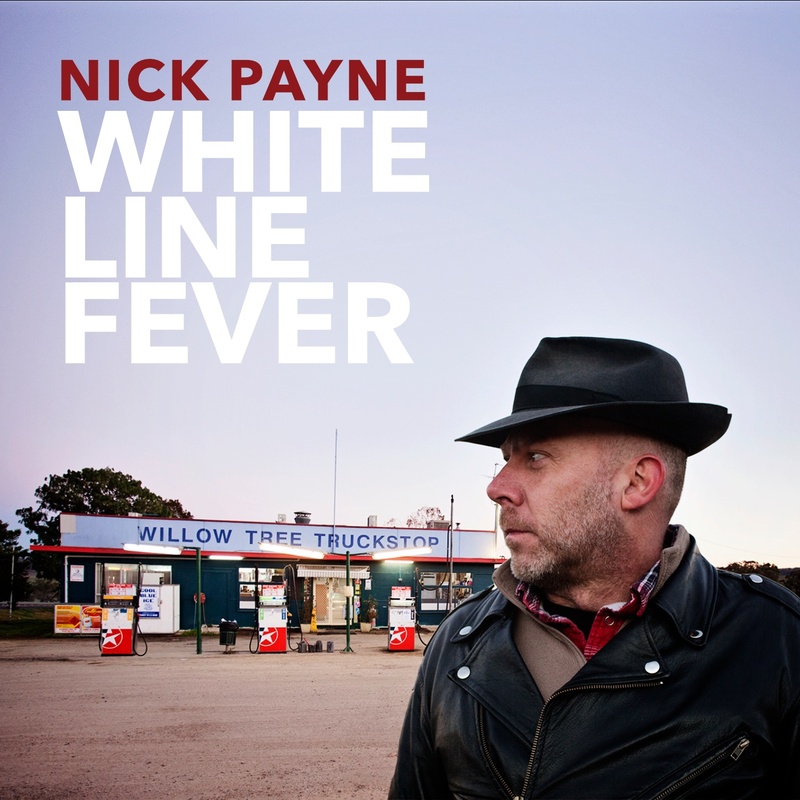 ‘White Line Fever’ is the new single from Nick Payne’s debut solo album “Rise Up Like A River”. Co-written with Benn Gunn a long time ago, this is a trucking song. Inspired by 70s trucker slang where you are hypnotised from prolonged night driving. Jy-Perry Banks from The Cruisin’ Deuces adds his musical magic on the pedal steel. This is the third single from the album, following ‘Rising River’ and ‘Old Sydney Town’. Every song is part of a pair with the equivalent positioned song on the other side. That is, the first song on side A ‘White Line Fever’ is a pair with the first song on side B ‘Old Sydney Town’ (first single) and they share the theme of “hardship”. The themes across the songs are: hardship, revenge, death, repose, loss, and salvation. When Nick first conceived the idea for the project he formed a group of “straight shooters” to guide, and encourage him. That group was Lyn Taylor (his musical and life partner, alongside Nick, Lyn is the lead singer of Sydney-based, bluegrass-inspired band Dear Orphans), Katie Brianna, and Karl Broadie. Karl, especially, provided enormous encouragement and direction to Nick. Nick’s only regret on completing the album is that he was unable to finish it before Karl’s passing from cancer earlier this year. The inside cover includes a dedication of the album to Karl “who without his inspiration this never would have happened. Farewell my beautiful brother”. Nick’s songwriting is inspired by driving around the country and writing about places he’s visited. This album includes places such as the M1 North of Sydney, the beach north of Noosa, Kinchega National Park, the Cunningham Highway through Boonah and over Main Range National Park, the Snowy Mountains and Victorian High Country, Loch Ard Gorge on the Great Ocean Road, et. al. The house band for side A was current and former members of The Wildes and Dear Orphans were the house band for side B. Nick self-produced the album with Lyn Taylor coproducing side B. No songs were recorded in a studio – they were recorded in lounge rooms, and most of side A in a friend’s art studio in Melbourne. Songs were recorded “live”, with minimal overdubs of some instruments later. The aim was two-fold, firstly to create an energetic, and real sound, and secondly, to forge great performances from musicians all in the same room, listening to each other without headphones, and being able to look each other directly in the eye. Importantly, all of Nick’s vocals that you hear on the record were recorded in the room at the same time. None of Nick’s vocals have been recorded later or “fixed” in any way. Aside from ‘White Line Fever’, the album includes co-writes with Karl Broadie ‘Enemy’, Katie Brianna ‘My Darling Kate’ (a duet with Katie), and Megan Cooper ‘Peace Tonight’. The photo on the single cover was taken at 6:30am one Sunday morning at the Willow Tree Truckstop about an hour south of Tamworth. The photo was taken by Lyn Taylor. Upcoming shows for Nick include the Nimbin Roots Festival and South Australia’s Fleurieu Folk Festival – sandwiched between these performances will be a first-time trip to USA’s music city Nashville. Highlight of the trip will be performing at the Sister City Jam on September 25th at the George Jones Museum as part of the Americana Music Festival.